The small picturesque town of Usk is located in the heart of the beautiful Monmouthshire countryside in South Wales. It sits on one of the finest salmon fishing rivers in the country, the River Usk, conveniently situated only 10 miles from the M4 yet feeling a whole world away. The streets of Usk are steeped in history with many charming old buildings, a wonderful Norman castle, a rural life museum, intact Victorian court room at the Usk Sessions House, beautiful churches and a Town Trail which includes 28 sites of historic interest, each with a Blue Plaque. Renowned for its floral displays and richly deserving of the title 'Town of Flowers', Usk is a regular winner of Wales in Bloom and hosts a colourful Open Gardens weekend in June with over 20 local gardens open to the public. The annual Usk Agricultural show is held every September on the outskirts of the town. 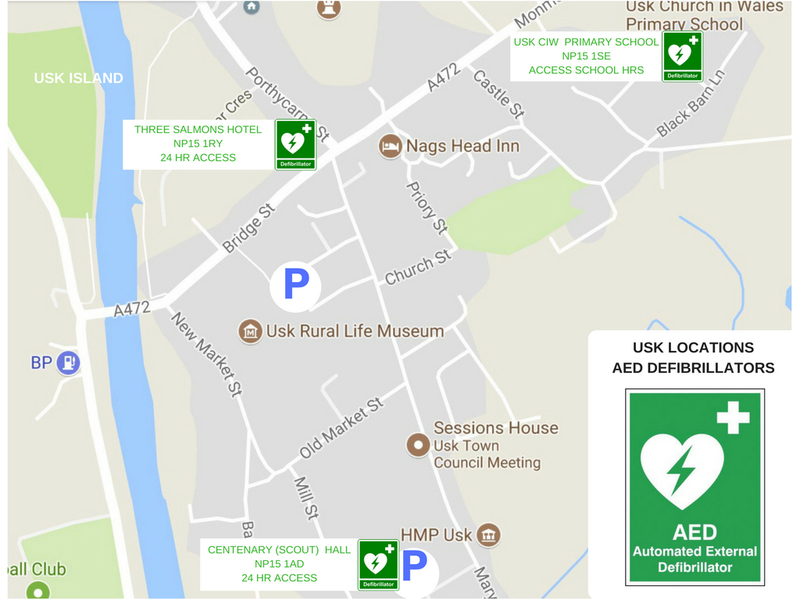 Usk is very popular with walkers and cyclists and in 2017 a brand new children's play area has been opened which is proving to be popular with young families. Usk's charm also lies in the range of its small independent shops, tearooms and pubs and there is plenty of accommodation in or near the town for those wishing to linger in this delightful place. You can find out more about our beautiful Town on this website. We'd love to see you in Usk - be sure to pay us a visit soon. It was great to see Usk feature in the first of the brand new BBC series 'Blooming Marvellous' screened on BBC2 on 16th April. Usk has earned the reputation and title of Town of Flowers. winning a much coveted Gold Award in the annual, RHS Britain in Bloom contest no less than 36 times since 1981. Well done everyone who took part in the programme you were all stars! The episode of Blooming Marvellous showed the year round planning and hard work by the Usk community and particularly the Usk in Bloom volunteers, to create Usk's fantastic floral displays every summer. The programme showed what a beautiful place Usk is to visit and if you haven't done so already why not plan in a trip for this year. Usk is beautiful any time of the year but the best time to see the floral displays is June to September. On the last weekend of June we have the Usk Open Gardens event, when, in addition to the floral displays around the town you can visit over 20 private gardens open for charity. There is no shortage of great accommodation in and around Usk and plenty of other things to see and do in addition to the flowers. For a list of these and links to accommodation go to our Visit Usk section on this website. To watch the Blooming Marvellous episode featuring Usk on BBC iplayer click the programme panel opposite. To find out more about the work of Usk in Bloom click here. To find out more about Usk Open Gardens click here.